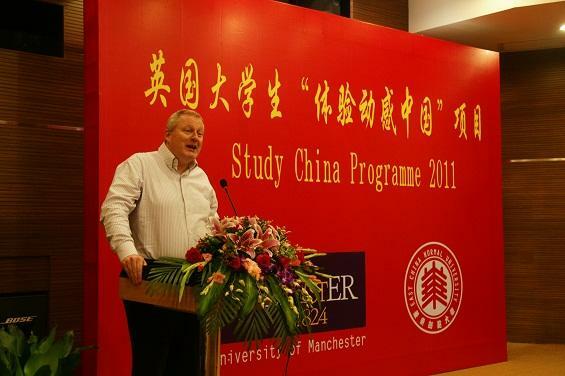 The Study China Programme 2011 had a ceremonious opening on July 20th. This programme is sponsered by the government of England, North Ireland, and Scotland. It is hosted by the University of Manchester and East China Normal University. This is the fourth time for ECNU to host this programme continuously since 2008. The opening ceremony started at 10:00 in the Yifu Lou Guest House. Director of the University Council of ECNU, Prof. Tong, Shijun had given a welcome speech. Director of the British Council, Mr. Gavin Anderson and his successor Mr. Matty Burney had given a speech respectively as well. Other speakers were Prof. Susan Tamin from the University of Manchester, the representative of Chinese student volunteers and UK students representative. Global Education Center of ECNU has arranged various activities for this programme, including Chinese language class and cultural classes, such as calligraphy, folk music, Taichi; lectures on Chinese economy; visit to Chinese families and Baosteel, etc. It is our sincere hope that Study China Programme students can experience the dynamic China in the following three weeks.